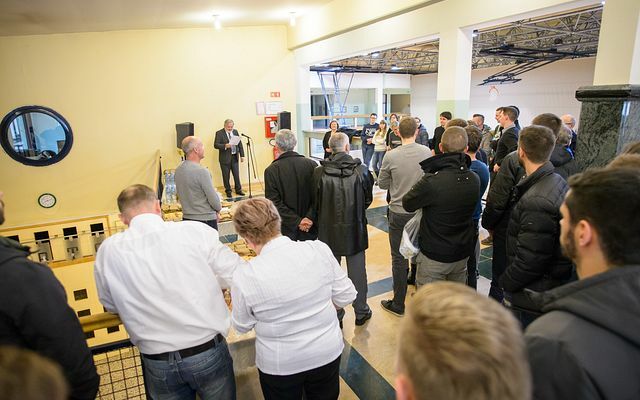 The Sports Centre named after Leon Štuklj of the University of Maribor held a meeting of all university sports teams and an official reception for the athletes representing the University of Maribor in various competitions. The Rector of the University of Maribor Prof. Igor Tičar organized the event. Male and female teams of players, rowers, swimmers, volleyball players and basketball players attended the meeting. All of them have recently performed well at the European Universiade held in Prague in November. The volleyball players took the third place, the basketball players became the fourth, and the football players of the University of Maribor were the fifth. In October this year, the University of Maribor resumed the rowing regatta competitions on the Drava River. Despite the rain and cold, the rowers of the university team won the first place. In the international competition held this year, they have also managed to become one of the best. The team of swimmers from the University of Maribor led by the Professor Silvester Lipošek participated in the National Universiade in May and won 11 awards in the individual standings (7 golds, 3 silvers and 1 bronze) and two silver medals in the relay race. Erik Hren was the best in the men’s standings, and Kaja Perkovič — in the women’s standings. Several competitors (Hren, Modrič, Perkovič) established six records during the Universiade. Since the beginning of the academic year, the competitions for the champion title of the University of Maribor have been resumed as part of the University Sports League. The competitions are traditionally held under the auspices of the Student Council of the University of Maribor. This year, 34 faculty teams are fighting for the champion title — young men bring out the best in football, basketball and volleyball, and girls — in volleyball. Games are held on Mondays and Tuesdays in the afternoon at the University Sports Centre named after Leon Štuklj. At the end of last season, the student of the Faculty of Medicine celebrated the victory in a volleyball tournament in the women’s standings for the third consecutive time. The second place was taken by the students from the Faculty of Economics and Business of the University of Maribor, the third were the student from the Faculty of Philosophy. The best volleyball team among boys became the team of the Faculty of Electrical Engineering, Computer Science and Informatics, the second place went to the Faculty of Education, the third — to the team of the Faculty of Economics and Business of the University of Maribor. The students of the Faculty of Civil Engineering were the best in basketball, the students of the Faculty of Medicine were the second, and the third place went to the students of the Faculty of Electrical Engineering, Computer Science and Informatics of the University of Maribor. In the finals of the football competition, the team of the Faculty of Chemistry and Chemical Technology competed with the team of the Faculty of Economics and Business of the University of Maribor. “Economists” were stronger than “Chemists” — 3:0. Footballers of the Faculty of Education took the third place. This year, the Leon Štuklj Day was held in the University of Maribor for the first time. In the future, the organizers want to extend the program of sporting events and also to hold a sports conference.